Look at those big moisty brown eyes! Stuart needs to lose some lbs but what a cutie! Classic Snoopy Beagle dog! 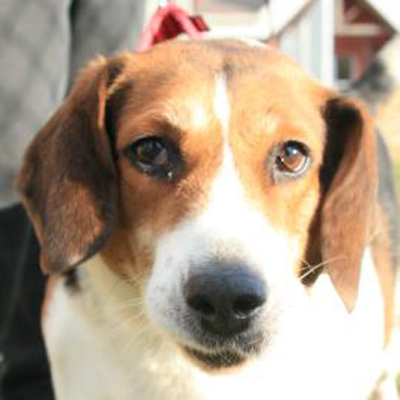 Stuart is a 6-year-old beagle mix who was transferred to Lollypop Farm from another shelter. At 90 pounds, Stuart could stand to lose some weight, so he’d love an owner who will take him for daily walks. He won’t just like the walks for exercise – because with his beagle background, Stuart loves to follow his nose! Stuart has lived with dogs and cats before, but he needs to meet any dogs in the household before adoption, as well as any children. Stuart is eligible for our Seniors-for-Seniors program, so adopters age 60 and older can take him home free of charge! sweet beagle. We have one, soon to be two, Dinky and Daisy. They are really sweet dogs. Who ever gets this guy will be so happy with him! aww what a cutie. quite a big beagle! i got a rescue beagle a few years back who was also a bit um pudgy. she's in great shape now, and such a joy in my life. i hope stuart finds a home veyr soon! I love Beagles' wooo wooo wooo bark! I also love the word "pudgy"